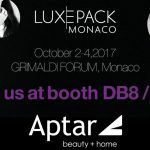 At the Luxe Pack trade fair in Monaco, innovation and creativity were the key themes in the Aptar Beauty + Home booth and the result was a success. The 30th year of this annual fair was a milestone event for the world leader in the dispensing solutions sector for perfumery and cosmetics. Aptar Beauty + Home attracted visitors to an elegantly designed booth with spaces dedicated to its new products and innovations. Hundreds of professionals from around the world saw our innovations firsthand and were able meet the Beauty + Home team. Fragrance Master, a new perfume applicator with a calligraphic sensory feel: an elegant ‘perfume pen’ that delivers measured doses, Fragrance Master puts the thrill back into the perfuming experience. Imagin Connected, a new digital experience with visual recognition: Aptar is establishing itself in the digital sector, in an exclusive partnership with the start-up company, MyPack Connect, particularly through ‘Imagin connected’, an ultra-flat and resistant spray allowing brands to enjoy 4.0 sampling. Neomix, a new vision of bespoke cosmetics: this all-new experience offers brands the possibility of personalizing their skincare formula or foundation by adding a booster presented in the form of a cartridge. The result? A single click to create a new bespoke product, adjusted to each skin type. Twin Set, a 100% airless pack to customize: with this innovation, Aptar offers the possibility of combining a duo of packs created with two formulas of your choice. Any combination is possible, catering to every whim and fancy to obtain a super trendy ‘on-the-go’ product. To present these innovations to journalists, Aptar held a press conference that included both French and international professional press and coverage included interviews with Monégasque television, where two out of three subjects were devoted to the new products being presented by Aptar. As part of the trade fair, the Formes de Luxe Award was given to Aptar for its new product ‘Magnet Connect’. This travel bottle produced for Louis Vuitton originated in the brand’s request for an exclusive, luxury refill solution. Rising to the challenge, Aptar invented a magnetic connector that could clip onto each new refill in less than a second, and in an intuitive way for the user. Protected by two Aptar patents, this gem of technology ensures the unit is entirely leakproof. Through this award, the judges wanted to recognise the product’s technological accomplishment and creativity, as well as its free-flowing elegance. To view more highlights from Luxe Pack Monaco, we invite you to watch the video below.